Plans for the redevelopment of First Baptist Church property were accepted by Vancouver City Council July 27. Well, you can’t complain that Vancouver City Councillors are a lazy bunch. While I was finishing off my weekly update, they were still hard at work. 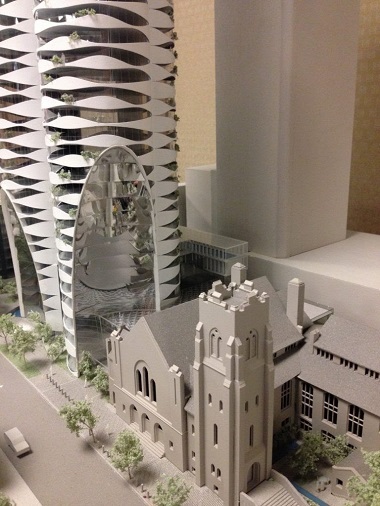 It was after 9 pm when they voted 7-1 in favour of rezoning the First Baptist Church property (969 Burrard Street & 1019-1045 Nelson Street). So, this will be a very partial report on what is quite a momentous event. There were hours of public hearings before city council on July 18 and 25, with many supporting the proposal and even more opposing it.
. . . The social housing, the community benefits are significant. The architecture – I think that block will be that much more extraordinary with a building of this magnitude. It’s great to have one final Bing Thom masterpiece in the mix, and to take care of the church, which has been such an important part of Vancouver’s landscape downtown for generations. With the changes downtown, we’re going to see more of this, there’s no question. There are people coming to our city and we need to keep building. We just have to do the best possible job of it. . . . This project is more than just a building though. . . . it revitalizes a church that has been serving this community for a long time . . . I would say that this is an iconic building, and not because of just the way it looks, but also because of who designed it. Bing Thom. This is the last Bing Thom building that he will have designed. We’ve paid a bit of homage to him, and I think that this will stand for some time as one of the more beautiful buildings in our city. I worry about shadow and light and congestion, access to air. These are all things especially in an area that is one of the densest in North America that are incredibly important. I’m concerned about the city pursuing the right kind of housing for local people. Forty-one units of housing [net, that is – 61 will be built but some units in current buildings are being lost] at a socially subsidized rate versus 331 high-end market condos does not seem like the right balance in this crisis time of housing in this city. First of all, this is well within the West End [Community] Plan. The West End plan was demanded by West Enders. I was elected before there was a West End plan and I heard over and over and over again the demand for a West End plan. So the staff went into a long process, and came up with a plan after huge consultation, the likes of which the city hasn’t seen before. 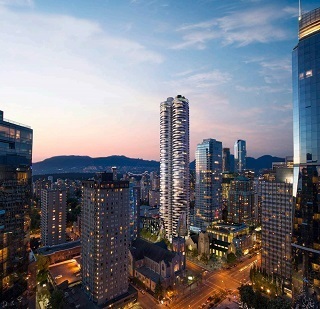 . . . . 7,000 people contributed. . . .
That plan calls for these towers on Burrard Street, on Alberni Street and on lower Davie Street. That’s precisely where these are to go. The centre, the core, of the West End will not be affected by these towers. . . .
We haven’t seen this kind of money before; we’re basically looking at $63.1 million in cash; 52 percent of that will go into community and civic facilities that we desperately need, parks and open spaces, childcare, transportation. If we wanted that kind of money from taxation, we would be looking at a seven or eight percent property tax increase. . . . The church itself will be seismically upgraded. They have, of course, been in the downtown area for a very long time, caring for the poor and the oppressed and they will continue to do that. And we also will get social housing, which is desperately needed. . . .
And then the design. I am personally so tired of glass towers everywhere. . . . I think our city at times looks like one big glass box. This is really an intriguing design. . . . I think it will be iconic in the centre of our city. . . . I know that there will be some people whose views will be blocked, and that’s been the case in the West End ever since it began to be developed in the 50s and 60s. . . . That simply is life in the West End, because the West End has transformed itself from single family dwellings into many, many highrises. . . . But for the greater good I think this is really an important development. Let us join together and continue to keep this process and the building project in prayer, trusting that the LORD is in control, that He is leading us, that He is ever good and faithful, and that through all this that Jesus Christ will be made known and glorified. If you would like to see a video of the city council meeting, go here; it runs from about 20:49 to 21:25 (8:49 to 9:25 pm). For complete background, including links to the public hearings July 18 and 25 go here. For my earlier stories go here and here. I wrote about the West End Community Plan here. ← Around Town: Kendrick Lamar, Bach Festival, Canada on Track . . .
Looks really impressive and meets the needs of both church and housing needs in the downtown area. Go for it!